Source: Mennonite Heritage Centre (Winnipeg), Mennonite Genealogy Inc. Collection (629-E:015). Salomon Salomon Ediger, a preacher and teacher of the Mennonite Church in Russia, was born 14 November 1876, in Gnadenfeld, South Russia, the son of Salomon and Susanna Mierau Ediger. He attended school in Gnadenfeld, and later taught in the elementary school there for several years, then studied theology at the Predigerschule in Basel. The director of the school was Wilhelm Arnold, a student of Tobias Beck, and the instructors in theology were Johannes von Huene, the father of the noted Tübingen professor; Hermann Gottsched, an authority on Kierkegaard; Samuel Preiswerk; and a certain Schütter. A number of talented and stimulating fellow students also contributed to Ediger's development into the personality he was later to become. For many years Ediger taught religion and German in the Zentralschule at Ohrloff, succeeding Kornelius B. Unruh. His wife was a daughter of Heinrich Dirks of Gnadenfeld, a missionary; she died in 1924. When religious instruction was prohibited in the Zentralschule, Ediger taught German and other subjects, and in order to be able to continue his work in the school, he gave up his ministerial status; but since he was unable to join the atheistic league, he was deprived of his position. To support his family, he accepted a position as instructor in the culture of silk in the collectives. But in 1934 he was arrested and sentenced to five years of exile. He returned to Melitopol in 1939 in broken health, and died on 16 November 1940. In August 1917 Ediger preached the opening sermon of the Allgemeiner Mennonitischer Kongress, a sermon that the delegates at that meeting will never forget. 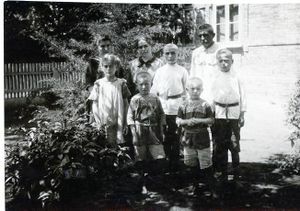 He was a Christian in whom there was no guile!—In August 1941, when the German army was about to enter the Melitopol district, his children were sent into exile. Their subsequent fate is unknown. Unruh, Benjamin H. "Ediger, Salomon Salomon (1876-1940)." Global Anabaptist Mennonite Encyclopedia Online. 1956. Web. 24 Apr 2019. http://gameo.org/index.php?title=Ediger,_Salomon_Salomon_(1876-1940)&oldid=133068. Unruh, Benjamin H. (1956). Ediger, Salomon Salomon (1876-1940). Global Anabaptist Mennonite Encyclopedia Online. Retrieved 24 April 2019, from http://gameo.org/index.php?title=Ediger,_Salomon_Salomon_(1876-1940)&oldid=133068. Adapted by permission of Herald Press, Harrisonburg, Virginia, from Mennonite Encyclopedia, Vol. 2, p. 149. All rights reserved.